Antonio De Curtis, alias Totò (1898 - 1967), is one of the most famous and popular Italian actors. Born in Naples, as a child he was adopted by the Marquis Francesco Gagliardi Foccas. The words "bazzecole, quisquilie, pinzellacchere" (trifles, pipsqueak, pinzellacchere) belong to the language Totò used: refined, yet spontaneous and playful. In his sentences he would often exchange words with other words to get a funny effect. This is one of his jokes: "I am in part 'nopeo' and in part 'Neapolitan'." (The pun is with the adjective "partenopeo" which means "Neapolitan"). By the early 1930s, Totò had become a leading figure in Italian theater and variety shows, so somewhat naturally the movies soon arrived. His first film is clearly a transposition on the screen of the sketches that had made him so popular on stage. Looking for work, Totò (his name in the film) gets a job at a beauty parlor disguised as a woman; after giving a famous singer a massage, he's discovered and fired. Later, he goes to the theater where the singer is performing, somehow becomes the orchestra conductor, and makes her show into a big hit. There are wonderful bits with several leading Italian theatrical performers, and a chance to see Miranda Bonansea Garvaglia, Italy's answer to Shirley Temple. Originally set to be directed by neorealist screenwriter and ideologue Cesare Zavattini - who did collaborate on the screenplay - this was the first film in which Totò's Neapolitan everyman persona was unleashed; throughout the movie there are prime examples of the tongue-twisting "Totò-isms" that would become a hallmark of his later work. The plot is about a porter whose excessive devotion to an image of Giovanni Battista (St. John the Baptist) arouses the ire of the local residents. There are star-crossed lovers, feuding families and a crazed, near-surreal plate fight that's a comic tour-de-force. The only film in which Totò acted with Anna Magnani - with whom he had worked in theater - the movie shows this extraordinary duo together with a very young Ben Gazzara. Times are always tough for Cinecittà extra Tortorella (Magnani), but especially at year's end, when there's simply no work. Hoping to improve her financial lot, she joins up with a fellow out-of-work actor (Gazzara) and a professional pickpocket (Totò) to fleece guests at a posh New Year's Eve party. Equal parts wacky humor and touching pathos, The Passionate Thief features Totò in his clown bianco (or sad clown) mode, whose presence always adds a hint of desperation to the action. Freely adapted from the play by Ettore Petrolini - with some choice borrowings from Moliere's The Miser thrown in for good measure - 47 Talking Corpses was, according to critic Ennio Bispuri, the first film in which Totò played a character who was more than a stand-in for his well-known theatrical persona. A huge box office success, the film was seen by more than 4.3 million Italian spectators in its first year of release. A miserly Baron (Totò) guards his treasure in a hidden strong box, intending for half of it to go for the construction of a school and the other half to his nephew Gastone. The local administration, however, grows impatient for its share, and thus slips the Baron a sleeping potion; when the Baron wakes up, he's convinced he's dead. 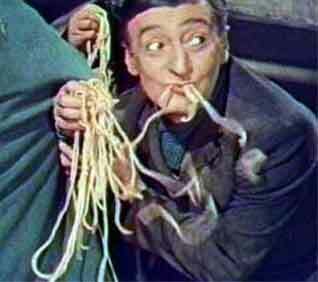 The film also features Totò in two musical numbers. Totò ends up in an insane asylum for assaulting the official in charge of extras at Cinecittà, after he's been refused a part. At the psychiatrist's office, he explains his philosophy of life: the world is divided between regular men, whose destiny is to be frustrated and provoked, and the "corporals," whose nature is to frustrate and to provoke. His world view is illustrated by various misadventures performed in hilarious detail - a demonstration finally judged so convincing the psychiatrist declares that Totò must be mentally healthy. The Italians have a wonderful tradition of anti-war comedies - the best known perhaps being Monicelli's The Great War, with Sordi; The Two Colonels is another proud and hilarious example of this trend. Totò wanted a "big American actor" for his co-star, and he chose Walter Pidgeon, fresh from the success of Advise and Consent. On the border between Greece and Albania, the control of a small town passes back and forth between the British and the Italians so often that a certain stability is maintained; the townspeople simply go about their business, and the two commanding officers, Totò and Pidgeon, enjoy cordial relations. But everything changes once Mussolini is removed and German troops arrive on the scene. Laura Caparrotti is the Artistic Director and Founder of KIT - Kairos Italy Theater. She is also the representative of the Family De Curtis worldwide.